The Times tells us all about the enormous harm done to children when they are moved from foster home to foster home - without ever mentioning the Times-fueled foster-care panic at the root of the problem. UPDATE, JANUARY 11: Although the Times story has huge problems, Robert Latham, Associate Director of the University of Miami School of Law Children and Youth Law Clinic has done a brilliant job of visualizing the underlying data - driving home the serious and real problem of multiple placement that the Times has made worse. Check out Prof. Latham's work here. A Tampa Bay Times investigation? Really? All they had to do was turn on a television and watch the stories on WFLA-TV. The television station broke the story and beat the you-know-what out of the Times on it all through 2018. The Times catch-up story goes on to describe the terrible toll taken on children by being moved from placement to placement. It does add some data giving a sense of how often it happens in Florida in general and Hillsborough County (metropolitan Tampa) in particular. Any story reminding people of this institutionalized child abuse has value, even one that adds little to what WFLA already told us. But the biggest problem with the story is the problem with all of the Tampa Bay Times reporting on child welfare over the past few years. In a state that’s been in the midst of a media-fueled foster-care panic since 2014, and where, by some measures, the panic is worst in the Tampa-St Petersburg area. The Tampa Bay Times has spent years committing journalistic malpractice, helping to fuel the panic by denying the very existence of the problem that drives everything else: needless removal of children. Who says children are being taken needlessly in the Tampa Bay area? Robin Rosenberg, deputy director of Florida’s Children First, a statewide advocacy organization focused on children’s rights, said the state is struggling because too many children are unnecessarily removed from their homes. Normally in news stories, that kind of sentence is a way of introducing a topic. Succeeding sentences elaborate on it, explaining what is meant by unnecessarily removed, why it happens and what can be done about it. But that’s not how they do things at the Tampa Bay Times. Without enough foster beds, placement becomes a scramble to find any home willing to take a child instead of matching a child with a foster parent trained to deal with children with severe behavioral issues. That can start a cycle where children who act out are repeatedly moved because foster parents are unable to cope, Rosenberg said. The story continues in that vein, describing the problem exclusively as one of too few foster parents, instead of too many foster children. The inevitable editorial that followed was, inevitably, worse. The Times editorial page has taken the position that there is no problem of children being needlessly removed; in fact, they’ve demanded that government be even more aggressive in tearing apart families. No dissenting view is allowed. So while the editorial summarizes almost every other aspect of the Times news story, there is not even a token mention of needless removal of children. Instead, the editorial repeatedly tells us that multiple placement causes further trauma or further damage - in other words, the editorial is telling us, damage over and above what those vicious, rotten, evil, no-good abusive parents did to them – so don’t even think that the answer might be not taking away so many children in the first place! 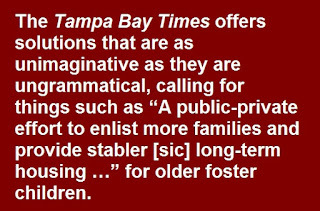 The Tampa Bay Times is not about to allow any serious discussion of the possibility that some children don’t suffer “trauma” or “damage” until they are removed from their homes. And the editorial tells us “a high-volume county like Hillsborough needs additional funding to meet this disproportionate need.” But the “high volume” is not because Hillsborogh County is some kind of cesspool of depravity with vastly more child abuse than anywhere else in Florida. Even poverty, so often confused with neglect, doesn’t explain it. Other large counties with higher rates of child poverty don’t take children at the same high rate as Hillsborough. No, the “high volume” is a result of the statewide foster-care panic, and how the Tampa Bay Times has made it worse in its part of the state. 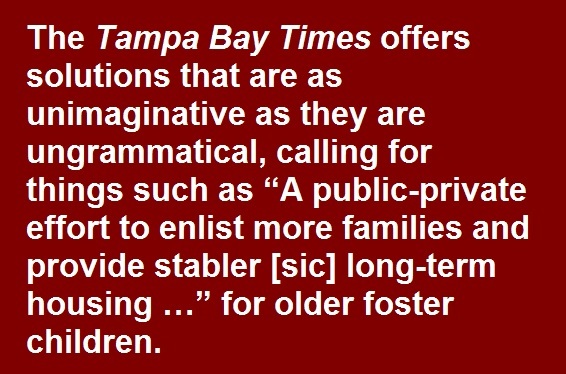 Since they refuse to face up to the real cause of the problem, the Times offers solutions that are as unimaginative as they are ungrammatical, calling for things such as “A public-private effort to enlist more families and provide stabler [sic] long-term housing …” for older foster children. The Tampa Bay Times has an unusual ownership structure. It’s owned by the Poynter Institute which sees itself a standard-setter for journalism. Too bad the paper it owns debases the standards of journalism whenever it publishes a story about child welfare. Their anguish over the death of another child “known to the system” is genuine. I think they’ll also be open to some new ideas. A little over a week ago, two columnists for the Tampa Bay Times, Sue Carlton and John Romano, wrote about still another death of a child “known to the system” in Florida. Often, when that happens, I reach out to the journalists in a letter. This time, I’m sharing that letter with everyone. It's on the NCCPR Child Welfare Blog here. Butterworth brought in another prominent Democrat, George Sheldon, to be his deputy. But if the joke was right about Crist’s secret plan, the joke was on him. Together, Butterworth and Sheldon engineered one of the largest transformations of any child welfare system in America. What was once the nation’s most prominent example of child welfare failure, became, relatively speaking, a remarkable success. When Butterworth left, there was speculation that Crist would never name Sheldon to the top job – after all, Crist had defeated Sheldon in two statewide election campaigns. But he did. And Sheldon expanded on the reforms begun under Butterworth. 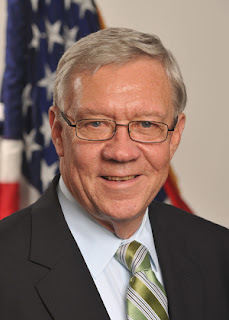 During the Obama Administration, Sheldon became the nation’s highest-ranking official in child welfare, running the Administration for Children and Families at the Department of Health and Human Services. While there, he championed real child welfare finance reform. The term “hero” is overused. So is the term “champion for children.” But they both apply to George Sheldon, who died last week at the age of 71. Reading the tributes to Sheldon it is striking how many of them come from former foster children. They knew that, finally, they had a real friend in a position of power. Sheldon moved aggressively to curb the use of psychiatric medication on foster children, and he prohibited the use of foster children in drug trials. He championed “normalcy,” working to clear away the bureaucratic barriers that made it hard for foster children to enjoy the smallest pleasures in life, such as a sleepover at a friend’s house. And Sheldon and Butterworth took DCF out of the bunker, opening records and speaking candidly about the agency’s failures. But their single greatest accomplishment was this: Sheldon and Butterworth dramatically reduced the number of children torn needlessly from their families – and independent monitors found they did it without compromising child safety. The dramatic transformation was featured in The New York Times. Yet this appears nowhere in the Miami Herald’s obituary for Sheldon. In the 1970s, when the Legislature passed financial disclosure laws, Sheldon often ranked dead last among his colleagues in the House. One newspaper led a story about the financial worth of lawmakers by noting that then-Miami-Dade Rep. Elaine Bloom disclosed ownership of a pure-breed dog whose declared worth was greater than Sheldon’s, Dyckman recalls. But the obituary profanes Sheldon’s memory by leaving out entirely his single greatest accomplishment in Florida. In 2,000 words, reporter Carol Marbin Miller found no room to even mention his work to safely and successfully keep more children out of the chaos of Florida foster care. But, of course, Miller has led a crusade against those changes. Now, she wants to pretend they never happened. But they did happen. And the best way to honor George Sheldon would be for the people of Florida to turn their backs on the Miami Herald’s fearmongering and demand that DCF return to George Sheldon’s vision of child welfare reform. That also was the claim throughout Miller’s 2014 series, Innocents Lost. After that series was published, the Herald got exactly what it wanted: The state stepped in far more. The number of children torn from their parents soared. So problem solved, right? No more child abuse deaths. Or at least, now that the state is stepping in more, fewer kids are dying, right? But that’s not what happened – according to a story in the Miami Herald, by Carol Marbin Miller. The story, published on August 10, looked back on the tenure of DCF Secretary Mike Carroll, who had announced plans to resign effective September 6. 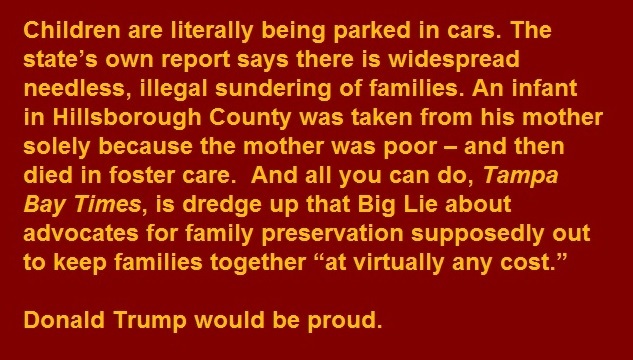 Back when Florida was emphasizing safe, proven approaches to keeping families together, under the leadership of Bob Butterworth and George Sheldon, Florida made a very different kind of national news – as in this assessment from The New York Times. But thanks to the Herald, and Carroll’s willingness to pander to the Herald, all that was wiped out. 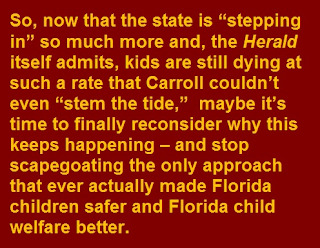 …When Carroll took the top slot, he stated that any child's death was "unacceptable" and that the department needed to improve. 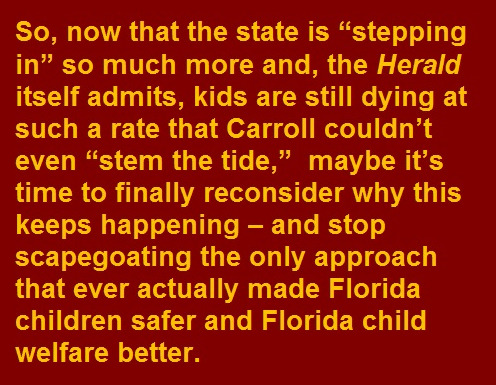 So, now that the state is "stepping in" so much more and, the Herald itself admits, kids are still dying at such a rate that Carroll couldn’t even “stem the tide,” maybe it’s time to finally reconsider why this keeps happening – and stop scapegoating the only approach that ever actually made Florida children safer and Florida child welfare better. The real reasons children known to the system sometimes die are the same as they always were – caseworkers overloaded with so many false allegations, trivial cases and cases in which family poverty is confused with neglect, that they don’t have time to investigate any case properly. But don’t take my word for it. Innocents Lost actually said as much – well, sort of. The series cited Alabama as a success story, without telling readers that Alabama created this success by emphasizing family preservation – and taking away children at a far lower rate than Florida. Here, again, The New York Times got the story right. It is not clear, however, who is going to challenge the Herald, and the way that newspaper has hurt Florida’s most vulnerable children. It’s unlikely that Carroll’s replacement will be any more willing to stand up to the Herald than Carroll was. 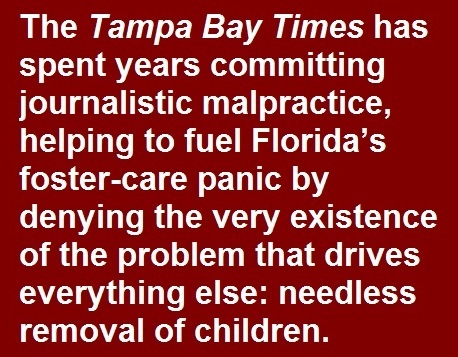 And with all the cutbacks in news gathering, the Herald and the Tampa Bay Times which is, if anything, even more extreme in advocating a take-the-child-and-run approach to child welfare, have a virtual monopoly on child welfare coverage. So Florida’s most vulnerable children still have no champion. And after Mike Carroll’s successor leaves the job, the Herald can write the same story all over again. In a column for Youth Today last month, I wrote about how the state’s own “Peer Review Team” report found that in metropolitan Tampa, Florida, far too many children were being needlessly taken from their parents and consigned to the chaos of a foster care system so awful that some of them were literally parked all day in a convenience store parking lot. In a follow-up column for this blog I noted that things are only likely to get worse. That’s because of who has been chosen as head of “community-based care” for Eckerd Connects, the embattled agency that’s sort of in charge of child welfare in the region. Eckerd chose Chris Card. Card has a long, ugly history of supporting a take-the-child-and-run approach to child welfare. Granted, a primary tenet of the family preservation movement is that people can change. But does Chris Card want to change? Unfortunately, it looks like the answer already is in: No, he doesn’t. The answer came in a story in the Tampa Bay Times. (As usual, the Times was playing catch-up to WFLA-TV, which had the same story days earlier.) It concerns the “corrective action plan” Card’s agency has to submit to the state. Just because we’re taking more kids into care doesn’t mean that’s wrong necessarily. And the fact that a team of your own “peers” said it’s not only wrong but illegal? Well, who cares, right? Card’s statement suggests that the parts of the “corrective action plan” about doing more to keep families together are just b.s. to placate state officials. This would be disturbing at any time. It’s especially now, when all over America, what Donald Trump is doing to children at the border has professionals speaking out about the catastrophic effects of tearing apart families. Yes, the motives are different. I think Chris Card has the best of intentions. But that’s not good enough – because regardless of the motive, the effects on the children are the same. While Hillsborough may have tilted too far in some cases toward removing children from their parents, it will be equally important not to over-correct and leave children in dangerous situations in the name of keeping families together at virtually any cost. Donald Trump would be proud. The editorial caricatures anyone who wants to keep families together in Tampa in the same way Trump says anyone who wants to keep families together at the border supports “open borders” and gang violence. In fact, family preservation isn’t just more humane than foster care. For the overwhelming majority of children it’s also safer than foster care. And the more you overload your system with children who don’t need to be there, the less time workers have to find children in real danger. Make them sit in a room and listen to the audio of desperate children crying for their mothers and fathers at a detention center on the border. Then make him listen again. And again. And again. Until, finally, it sinks in that the children needlessly and illegally torn from their families in Hillsborough County, Florida, every day, shed the same sorts of tears for the same sorts of reasons. And finally it sinks in that their casual dismissal of the problem of needless removal is adding to the terrible harm already done to the vulnerable children of Hillsborough County. Why is Tampa, Florida child welfare probably going to get even worse? Because one of the biggest cheerleaders for one of the worst leaders in modern child welfare history is now in charge of making it better. to spend their days in cars at a convenience store parking lot. In a column for Youth Today on June 21, I discussed a report blasting the child welfare system in metropolitan Tampa, Florida, for tearing apart families needlessly – and illegally. The report, commissioned by the state child welfare agency itself found that workers are doing this, in part, because they are so afraid of being vilified by the Miami Herald and/or the Tampa Bay Times if they leave a child in her or his own home and something goes wrong. 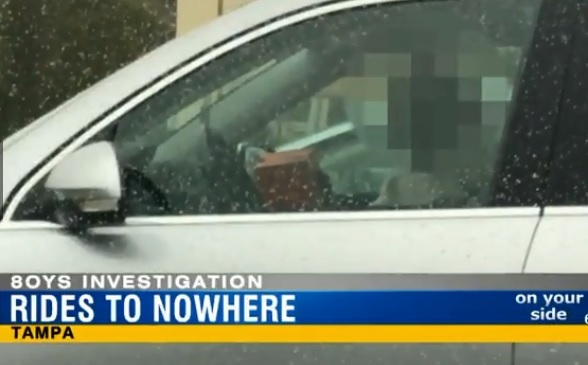 This has plunged the entire child welfare system in Hillsborough County into chaos, complete with children being literally parked - forced to spend days and sometimes nights in cars in a convenience store parking lot, as revealed by WFLA-TV, which has beaten the Times on this story over and over again. Of course, the overload also has made it even less likely that caseworkers will find children in real danger. Unfortunately, one of the key steps taken since the crisis emerged is likely to make things worse. It has to do with that time honored practice in child welfare, the Ritual Sacrifice of the Agency Chief. The lead agency for Hillsborough County is Eckerd Connects. They got the contract after high-profile tragedies prompted the state to oust the previous “lead agency,” Hillsborough Kids, in 2012. Now, of course, with Eckerd Connects having made everything worse, that agency is being threatened with losing its contract. So they replaced their chief of community-based care. But she was replaced by a questionable choice. 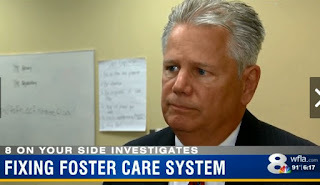 Eckerd has now put in charge of an agency that holds far too many children in foster care* someone who built his career cheerleading for taking away too many children. But the connection to Hillsborough Kids is not the reason this choice is so problematic. Difficult as it may be to believe at the moment, there was a time when Florida child welfare was even worse than it is now. It was run by the single worst leader I’ve ever encountered in child welfare anywhere in the United States. It was run by someone who set off the largest single-year foster care panic I’ve ever seen anywhere in the United States. It was run by a former judge named Kathleen Kearney. Kearney was appointed in 1999 by then-Gov. Jeb Bush in the wake of a high-profile child abuse death. In her first year, the number of children taken from their parents in Florida skyrocketed by 50 percent – because that’s what she wanted. That’s not because she was ill-motivated. On the contrary, I view her as a tragic figure in child welfare precisely because she truly believed that this kind of confiscation of children would protect them. It backfired so badly that Florida became the national model of child welfare failure, generating headlines across the country. Full details are in NCCPR’s reports on Florida child welfare. But Kearney did have her fans. In fact, one of the leaders of the Kathleen Kearney Fan Club was Chris Card. At the time he was running one of the first experiments in child welfare privatization, in Sarasota. Under the leadership of Gov. Bush and Judge Kathleen Kearney … Florida is now in the beginning stages of a full-fledged reform of the child-protection system. ... With [the governor's] significant financial commitment and the changes in policy and law that make the focus of the system 'child safety,' we ought to be shouting from the mountain tops! When you go into their living rooms for the first time, they say, “Get out of my house.” We've implemented some voluntary programs for people and tried to prevent the abuse from happening. To think that's going to make a dramatic difference is a tough sell. But Card backed his ugly words with action. When he first came to Hillsborough County to run Hillsborough Kids, he quickly canceled contracts for programs to help keep families together. Board members of Hillsborough Kids also have been asking Card to work to reduce the number of children in Hillsborough County who have been removed from their homes and placed in various types of foster homes. A DCF report issued late Tuesday says the agency should have done a better job in this area. You can read more about Card’s track record in this excerpt from our 2002 report on Florida child welfare. So now, with Hillsborough County taking away children at the highest rate in Florida, even as Florida tears apart families at a rate above the national average, and with the state’s own report condemning the high rate of removal and calling it illegal, are we really supposed to believe that the best person to turn this around is – Chris Card? *-Eckerd would argue that the high rate of removal is not their fault. They don’t make initial decisions on removal because Hillsborough is one of a handful of Florida counties where sheriff’s deputies do the child abuse investigations. But the state report noted that part of the reason the deputies take so many children is they have no confidence in Eckerd’s in-home services. And, as the lead agency, Eckerd has the most influence in the system. Eckerd could educate the deputies about the harm of removal and press the department not to take so many children needlessly. They also could press the courts to return children they thought the sheriff’s deputies had removed needlessly. Chris Card is, at best, an unlikely choice for such tasks. Young children torn from their parents, sleeping in a different bed every night. Families torn apart needlessly - and illegally -- over and over again. But this time it's not the U.S.-Mexico border. This time it's Florida. Who says it's illegal? A report commissioned by the state itself. Why is it happening? In part because caseworkers are terrified of "media consequences" if they leave a child in her or his own home and something goes wrong.